Enhancing internal and external collaboration with the ArcGIS platform. In the novel You Can’t Go Home Again, mid-20th-century American author Thomas Wolfe fictionalizes his hometown. Wolfe’s main character gets into trouble, angering the townsfolk of his hometown. I can relate. I grew up in a blue-collar city, where the main claim to fame was that at one time it was the most densely populated city in the United States. That meant packed houses and city streets. You could say that I grew up on the streets of this very crowed city. Shortly after marrying and having a child, my wife and I moved to the suburbs. Later, my career became running electric operations for the power company that covered my old home town. About 15 years ago, my hometown City Council invited me as a special guest at the chamber. Residents packed the public session; I felt certain at least a few might have gone to high school with me. The residents weren’t happy. I felt like Wolfe’s character. There were issues. Residents pointed to a rash of power failures from the past couple weeks. The city had good reliability compared to surrounding cities and especially compared to the national average. The city had a great mix of underground and overhead circuits and not many trees to bring down lines. The more vexing issue was the condition of city streets. Residents had been giving the Council heat for potholes and poor street conditions. So the city’s repaving program had gained attention. On a number of occasions, however, just after the city had completed a nice, newly paved street, the crews I oversaw dug a huge trench so they could run an underground cable. Then, one of the councilors noted that I (though he meant my crews) had had the audacity to cover the trench with cold patch, a tar-like material that temporarily covers potholes and trenches. Since the tar is cold, it tends to wear off very easily. It creates little tar pebbles. When a car drives over a cold patch, you hear the material make an awful noise against the car wheel well. City council and residents wanted to know why my power company was ruining their beautifully paved streets just days after taxpayer dollars had paid to pave them. I explained the power company had issued work orders for those streets some time ago. We had applied for and received permits for this scheduled work. It was unfortunate, I agreed, that the city had just paved the street before we dug it up. I refrained from reminding my audience that the city could have bothered to check its open street permits and align this with their paving schedule. I didn’t want to end up like the protagonist in Wolfe’s novel. An irate Council member reminded me this had happened regularly in the past. I further agreed to have my company repave the full street section we had ruined. And I agreed to have better communication with the city. Yet, despite my best efforts, we continued to experience a lack of foolproof coordination. What does this story have to do with GIS? A lot. The power company had a GIS complete with work-order schedules. The city had a mapping system which included pavement scheduling. At that time, it would have been tough to somehow connect the two systems and see where projected work overlapped. Imagine if we had the ability to do that. Now imagine if the telephone company, gas company, and transit agency could do that too. So many dig-ups could have been combined. At Esri, we talk about how GIS underlies the smart grid. We write papers about how cities can prioritize capital spending by running vulnerability analyses. We promote proven, high-value apps for gas-leak identification, integrity management, and theft detection. Yet you wouldn’t think it would be so difficult to let one organization know another’s plan of action. Barriers, spanning technology to people to processes. It’s not hard anymore. The ArcGIS platform provides the technology and processes to break down communication barriers, so organizations and departments can share information and collaborate. Teams, departments, and companies can leverage the platform to securely and seamlessly share map-based information. And it’s easy to use, so people can readily adopt it. What is the ArcGIS platform? It’s like any platform. Phil Simon explains the idea best in The Age of the Platform: platforms allow people to connect and obtain information. Platforms include Facebook, Apple i-products, and Amazon. These destinations let you communicate, share insights, gather information, and get things done. The ArcGIS difference is that its platform takes advantage of maps—a natural means of communicating spatial information. What better platform for utilities (and cities too) to use, considering they must connect departments, field workers, regulators, the media, and customers who exist across geographic relationships. The ArcGIS platform lets utilities, municipalities, regulators, and other agencies answer simple questions. What’s going on right here and right now? Should we know about things other stakeholders are doing? If everyone can access the platform then they can do this. A woman with a painful expression at my painful homecoming raised her hand. She told a story of how I had ruined her daughter’s wedding. Crews working overtime Saturday had dug up the street outside a church. 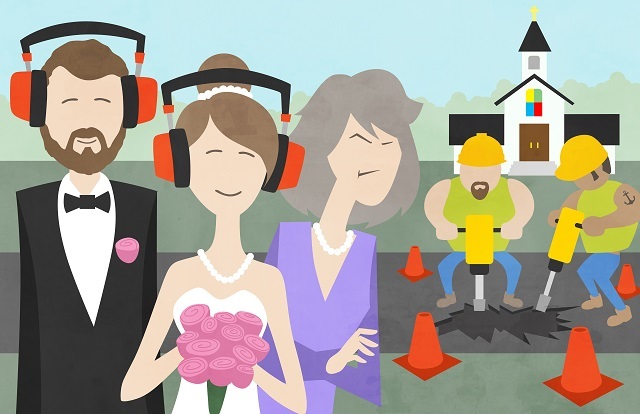 Their jackhammers drowned the organ during the wedding march. The street could be fixed, but that memory can’t. Today, the ArcGIS platform can help. Utilities can use it to publish (via web services) all the work going on throughout a city. I look back on that meeting and know the situation could have been better. If we’d had the platform, and taken advantage of it, I could have gone home a hero. Or at least, I would have settled for not going home a villain.